Funny thing about me is I’m obsessed with Paris. Like unreasonably obsessed. I think it all began when I started taking French classes in High School. The language just clicked for me. After that first language class, I became obsessed with the Parisian style, culture and the overall je ne sais quoi. These days I spend my time figuring out ways to visit Paris. The last time I was in Paris was for my birthday in February 2014. I rented an apartment in Montmartre and pretended to be a local for a week. IT WAS AMAZING! Realizing that it has been three whole, long, painful years, I decided I needed to go back ASAP. This time in the spring. Specifically, April 2017. Paris in the springtime! I don’t have much planned yet but one thing I do know is that I’m renting an apartment in the Marais. Paris is divided into 20 districts called arrondissements, and the Marais district is located in the 4th arrondissement. (It’s next to the 1st, which is home to the Louvre.) The 4th is home to the quintessential Paris “style of three crayons”, which is referring to the black slate tiles, red brick, and white stone the wealthy used to build their homes in the early 17th century. Another popular style of building in the Marais borrows from the Italian rococo. It features wrought-iron balconies and ornate details like sculptures and pavilions. I wanted to celebrate my upcoming return to France. Um, yes, it’s that big of a deal. The only way I know how to celebrate is with wine and food. And in this case, some delicious French wine and food. Where else do you go when you need a little France in Boston – Aquitaine. 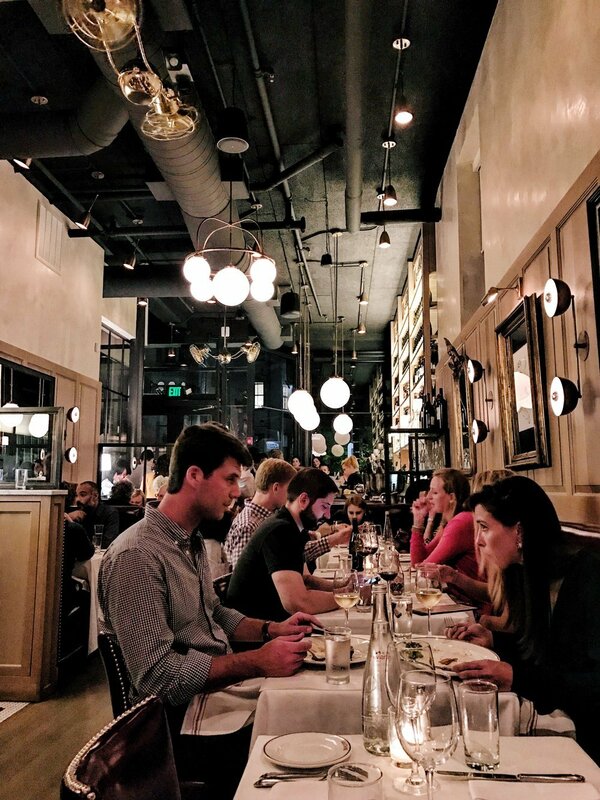 Aquitaine is located on “Restaurant Row” in the South End neighborhood of Boston. It’s a classic French bistro that was just renovated this spring and summer and recently reopened. I hadn’t visited since the reno and after seeing a few pictures online, I couldn’t wait to see the overhaul in person. Prior to arriving, my friend and I determined that we are a-ok with snails and poached eggs. (We obviously scouted the menu beforehand. Like any normal person would. And clearly this is why we’re friends.) After being seated in the coziest little booth, we ordered a bottle of red wine to share and put our previously agreed upon dietary lack-of-restrictions to the test. We ordered Escargots Bourguignon and Shaved Brussel Sprouts Lyonnasie, aka snails and a salad with a poached egg. Well, this was the quickest flight to Paris EVER. Both dishes were classically prepared and absolutely delicious. We were so obsessed with the garlic oil the escargot was prepared in that even after we ate everything, we asked that our waitress not take the empty dish. We wanted to soak our bread in it. Back off, don’t judge. For our entrees, we went seasonal and classic. My friend ordered Filet Mignon Au Poivre. Holy moly! This dish is excellent. The filet was perfectly medium rare, and the sauce was rich and flavorful. It was paired with pommes gratin and roasted scallions. You can’t go wrong with onions, potatoes and cheese. I decided to go with the special – a pork chop with apple, cabbage and spaetzle. It’s was outstanding, and really prepared me for the impending fall season. I don’t normally order pork, but the bone-in preparation really help with the moisture. The apple and cabbage was tangy and tart, and the spaetzle complemented the meal very nicely. I literally ate everything. I’m not lying. I cleared my plate, helped with my friends meal, and all this is after we devoured the apps. We were about to roll ourselves home, but the coffee and dessert menus were really winking at us. Fichtre ! An amazing meal has come to an end. It was the perfect way to kick off my Paris trip planning. Aquitaine is open seven days a week, serving lunch and dinner during the week. Brunch and dinner is served on Saturday and Sunday. You can check out the Aquitaine menu here. PS – I spied on the Aquitaine brunch menu and c’est tout! I’m definitely going back for the Kale & Leek Gratin and Brioche French Toast. NOM. Thank you to Aquitaine for generously hosting me! All opinions and images are my own.